AudioTheme is one of best WordPress music themes developer in the WordPress CMS theme designing industry. It was found in the year of 2013 by WordPress professional designers those who really create music and bands dedicated websites. Now they have created dedicated WordPress themes to use for music and bands oriented websites. These themes will best suit for those who think to create a professional online music site to sell their albums, showcase their songs, listing music DVDs, CDs, and live play or using some 3rd party embed music to code to play online. 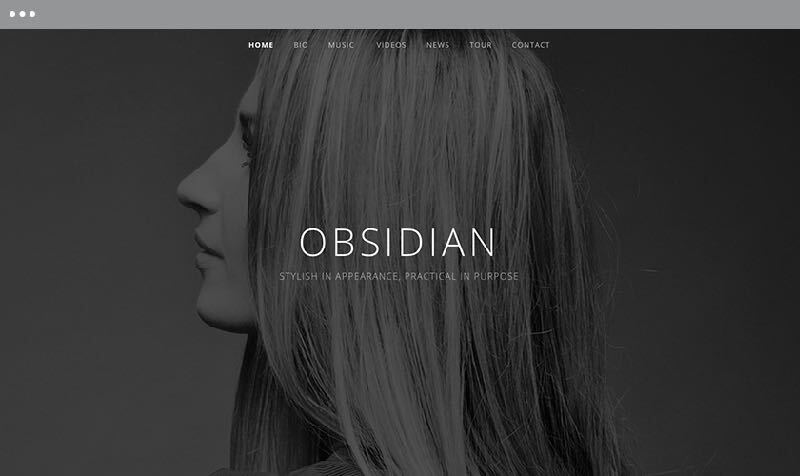 You can create beautiful and fully functional sound websites that work on all of your devices. AudioTheme will perfectly suit for any kind of music-related websites, such as artists, musicians, bands, record labels, and anyone that manages websites for independent music makers. These themes are powered by a powerful “AudioTheme framework”, which will come with plenty of amazing features to create your online gigs, music, discography, videos and more. AudioTheme comes with 4 dedicated WordPress music plugins that can be used on all of these WordPress music themes. AudioTheme Framework – Easy to manage the audios, videos, discography, music from this plugin. Cuebar – You can showcase the music with a sleek, fun audio player that anchors to the bottom of the website. Cue – Create beautiful, fully responsive audio playlists in WordPress. Simple Photo Albums – Create photo albums from a group of native WordPress galleries. There are plenty of features of available with AudioTheme. 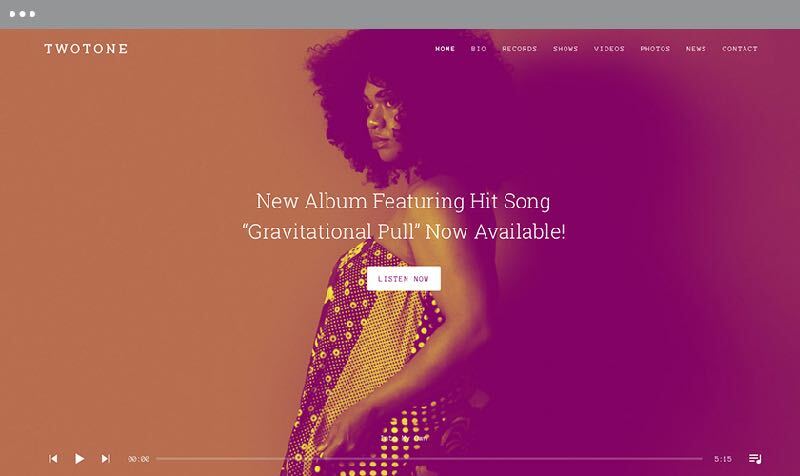 Since these themes are professionally designed to use for music-oriented websites. Hence, you will find all the features to create a music or band websites online. Such as a dedicated music WordPress plugin and a powerful AudioTheme framework with full functionality for a modern musician or band web presence. Display your album, assign, tracks, plug in your cover art and go. You can build your own video gallery from 3rd party websites and showcase on your website. Add your own content, including dates, photos, videos, and blog posts. Schedule the details about your next show that including the location, date, timings, city, state, ticket availability and more. 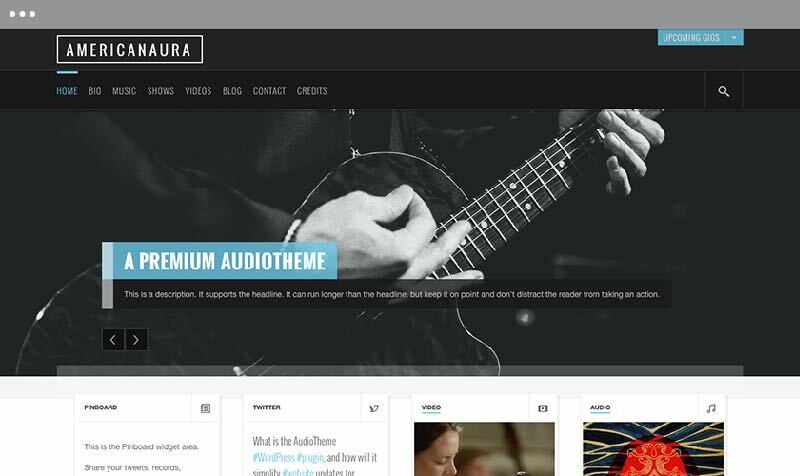 Americanaura WordPress Theme is a simple and classy customizable web design for music or band-oriented websites. It comes with plenty of amazing features that including customizable marquee music, pin board and display site-wide jukebox options. Nowell Theme is another great music WordPress theme from AudioTheme with lots of features to display your music album and discography. It is a responsive web design that supports to work on all of your devices. The videos and playlists are opening in lightbox effect and insert custom media into the header of any page with options for images, slider, video and more. 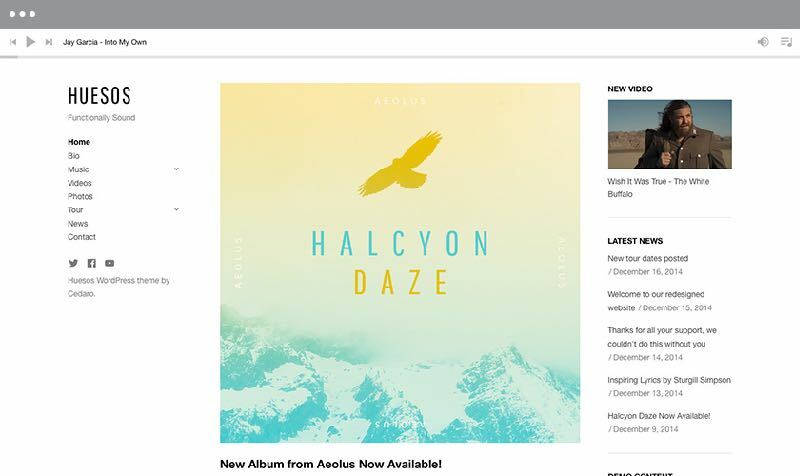 Huesos is another great design for music WordPress theme to showcase your music straightforward and content-focused options. It will give you a perfect web presence for your music and bands. In this theme, you can easily sell your album and songs using Easy Digital Download plugin. 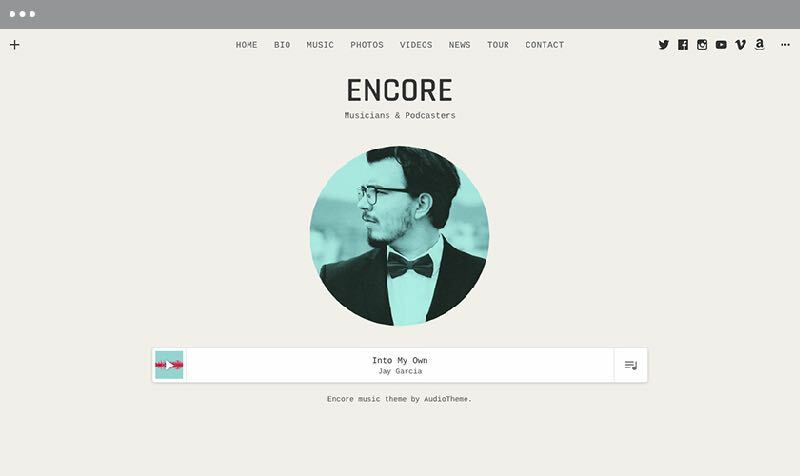 Encore is a unique design to display your music and videos with gridded archives, showcase a playlist in a distinct, site-wide player and much more options. There is also a single record page to sample your music in a sample, organized tracklist and that provide a link to purchase it. The Obsidian theme is designed with full background options and various customization possibilities. It comes with a custom gig to display in a different way with a list of upcoming gigs or shows, past gigs, single records, and tracks. Add your latest YouTube, Vimeo, or another supported video service by simply providing a URL. 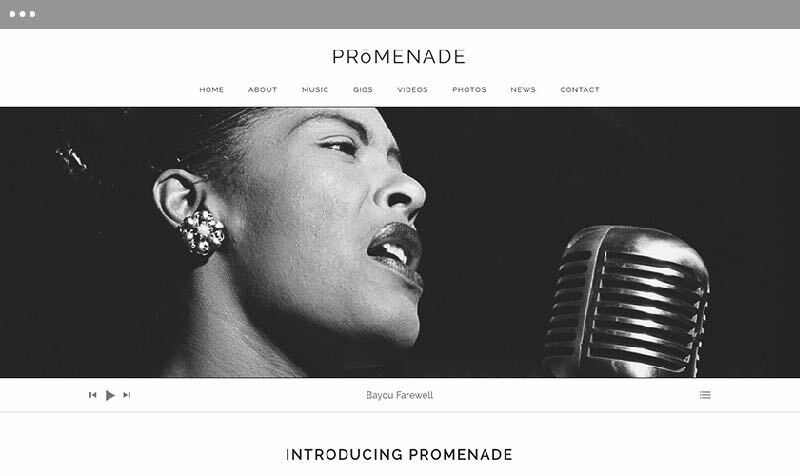 The promenade is a minimal and elegant responsive WordPress musician theme from AudioTheme with tons of features. 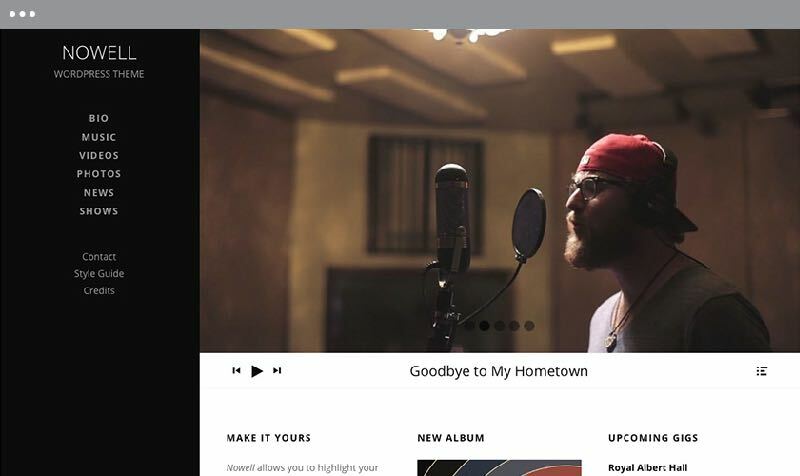 The homepage is fully customizable to display the featured music, showcase the music with tracks and play live, can also add lyrics, download links and many more. 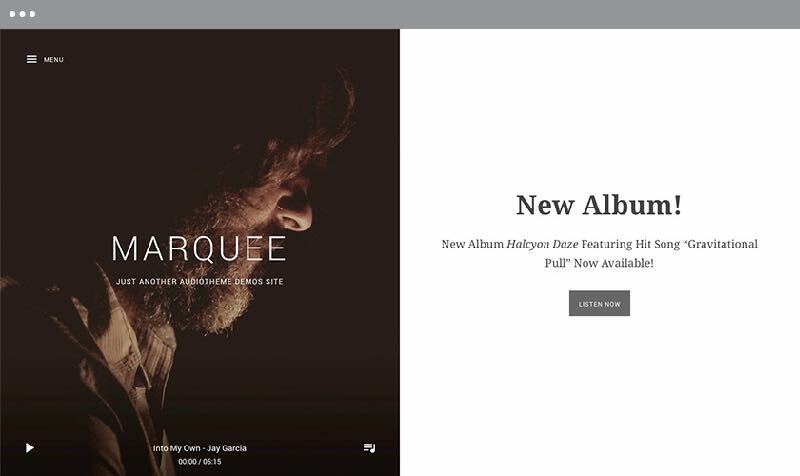 Marquee is a unique design that comes with split screen layout WordPress Theme and super fast page loading for your audios, videos, mp3, and albums. Two off-screen panels can be toggled to reveal your navigation and an optional site-wide player. Twotone is coming with a large header image that attracts the visitors and a site-wide audio player with unlimited functionalities. Everything is customizable that include styling your image, custom fonts, custom headers, live WordPress Customizers, upcoming gigs, past gigs and many more. Popbelly is another great addition to Audio WordPress Theme. It is coming with all necessary features to create a wonderful audio related websites. Popbelly WordPress Theme is very responsive web design that supports to work on all modern devices and latest smartphone devices. Since it has been dedicated to using for music, video, tour dates, you will have appropriate web section features. Even you can customize the section using WordPress Live Customizer from front-end section. You can showcase the video album, audio album; podcast and sound cloud integration to autoplay songs from 3rd part websites. Present your albums, audios, videos, singles, and EPs in a beautifully organized music archive. 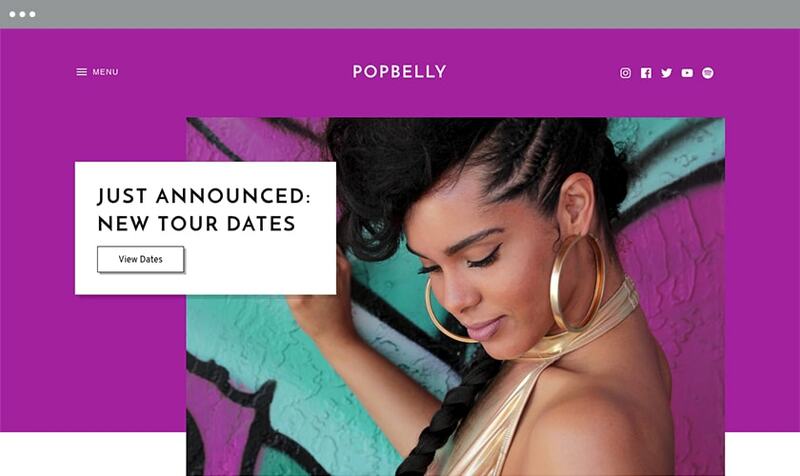 Popbelly theme is also allowing you to showcase upcoming audio events and sell tickets online! Additionally, Every event has its own page for easy sharing to Facebook, Twitter, and other social networks. Individual event pages display time, date, venue details, ticket information, calendar links, and more. You will also see the event venue details with Google embed map!